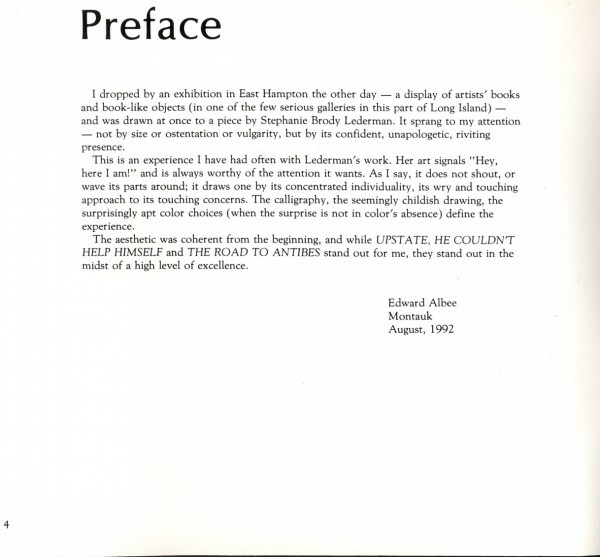 I dropped by an exhibition in East Hampton the other day — a display of artists’ books and book-like objects (in one of the few serious galleries in this part of Long Island) — and was drawn at once to a piece by Stephanie Brody-Lederman. It sprang to my attention — not by size or ostentation or vulgarity, but by its confident, unapologetic, riviting presence. This is an experience I have had often with Lederman’s work. Her art signals “hey, here I am!” and is always worthy of the attention it wants. As I say, it does not shout, or wave its parts around; it draws one by its concentrated individuality, its wry and touching approach to its touching concerns. The calligraphy, the seemingly childish drawing, the surprisingly apt color choices (when the surprise is not in color’s absence) define the experience. The aesthetic was coherent from the beginning, and while UPSTATE, HE COULDN’T HELP HIMSELF and THE REOAD TO ANTIBES stand out for me, they stand out in the midst of a high level of excellence.